Barry Sullivan’s a ‘Man on a Mission’………. He rattles along at 100 miles an hour……forever exuding positivity……responding to the mobile phone that beckons incessantly……squeezing meetings, interviews and networking into his hectic schedule. It’s breathtaking even to watch him in action. In his time, ‘Sully’ has adroitly rubbed shoulders with Captains of Industry, political heavyweights and ego-maniacs. But to me, he’s no different to the 18 year-old kid who rolled up to the Rovers’ opening pre-season training session in 1981. 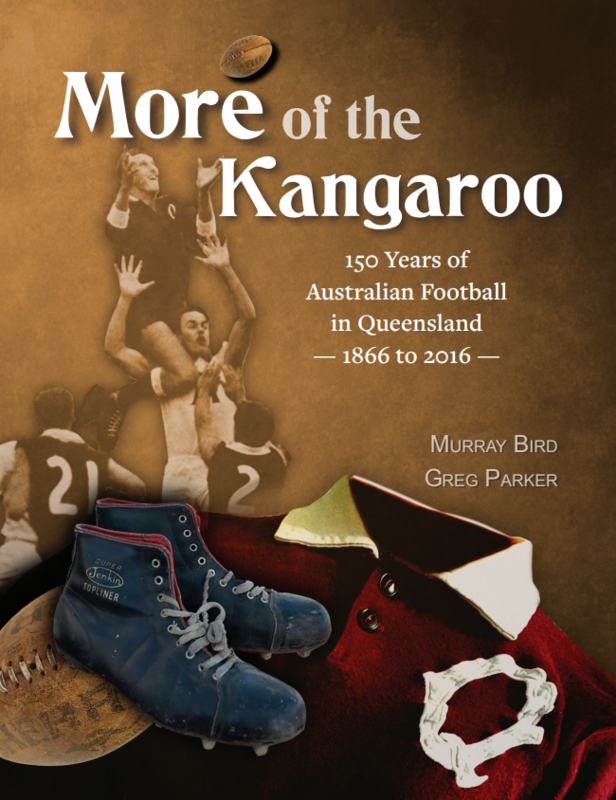 He tagged along that night, he says, with an Everton neighbor, Gary Allen (a dual-premiership ruckman), who was considering a come-back with the Hawks. He was mad on sport, but not over-eager to follow in the footsteps of his dad Kevin, who was a prominent racehorse trainer. Instead, he started an engineering degree at Monash University and would travel home each week-end to play with the Rovers. So he continued to be a fleet-footed, energetic winger/half-forward with the Reserves, in between dealing with a succession of soft-tissue injuries. But he knew, half-way through his third year at the Rovers, that he must be getting close to that eagerly-anticipated senior berth. 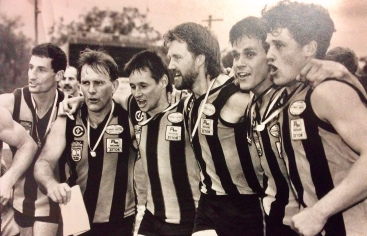 He played in the Hawks’ Reserves premiership teams of 1983 and ‘84, but his break-out season was 1985, when he cemented a permanent spot in a side which included a few handy debutants in Tossol, Walker, Allen, Goodear and Bryce. Word subsequently filtered through to Melbourne that this ‘bush dasher’ had something special. 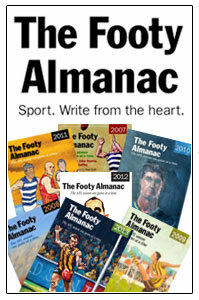 ‘Sully’ was invited to train with the Demons during the season, with a view to possibly joining them in 1986. So it was back to the Rovers……and reality. ‘Sully’s’ engineering degree, in which he majored in electronics, proved a handy tool. The Computer Age was upon us and he found himself in demand. Fate fell his way when, after spending some time at the electronics firm E-Mail, he was offered a position at the Wangaratta division of IBM. Within a fortnight of starting, he was sent to Florida, to work in their development laboratories. And for the next few years his pre-season training plans would be thrown into disarray when he’d be somewhere in the U.S for two or three months, on assignment. By 1988, Sully reasoned that there were exciting times ahead, with all the young talent starting to emerge at the Rovers…..maybe even a chance of a premiership, sometime in the future. Two games into the season – after an 80-point whalloping from Wodonga – he headed off to the States for another lengthy stint. He followed, enviously, from afar, as the Hawks stormed into the finals. 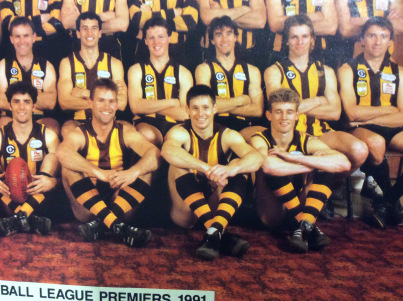 Sully’s meteoric rise through the leadership ranks at IBM certainly hadn’t affected his zest for footy. The Sullivan resume includes a bag of seven goals and one of six in the 149 goals he booted in his 112 senior games. The Hawks, having fought their way through to the Grand Final after a shock loss to Yarrawonga in the Second-Semi, steamrolled the Pigeons by 69 points. 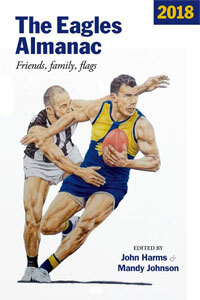 Yarra still had a slim chance at three-quarter time, but when Neale McMonigle snagged the first of his four last-quarter majors, and Sullivan ran into an open goal, it was all over. By now, Sully had become Manufacturing and Engineering Manager at IBM, but footy and tennis were his outlets. 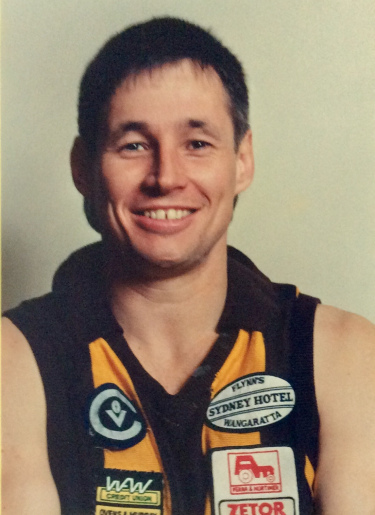 He played another 13 senior games in 1992, and in eight Reserves appearances, showed enough to finish third in the B&F. That drew the curtain on the Sullivan playing career with the Hawks. 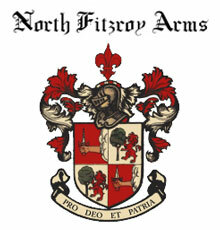 It had been a triumph of perseverance and dedication, interrupted by those darned soft-tissue injuries, and marked by a lengthy apprenticeship in the Reserves. For the next two years he travelled through Europe, Asia and the Americas, as part of a world-wide computer task-force. When he returned home, a good mate, Peter Mulrooney, coaxed him into having one last season – at Greta. 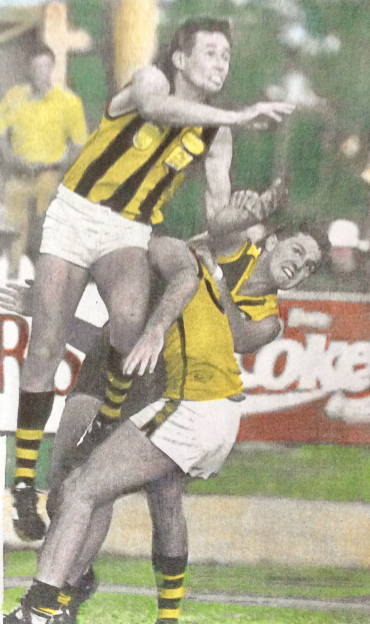 The Blues dropped just one game on the way to the 1995 flag, and proved too strong for a persistent Beechworth. For Sully and ‘Mul’ it was as good a time as any to hang up their boots. Just to add a further string to his academic bow, he gained a further qualification when he completed a degree in Business Studies at Stanford University, in the U.S.
IBM was booming at this stage, and, as site General Manager, Barry had more than enough on his plate. As the largest manufacturer of electronic goods in the country (with a turnover of $600 million – $400 million of that exported), the company was an intrinsic part of the local economy. It was mind-boggling to imagine the consequences should they happen to depart. 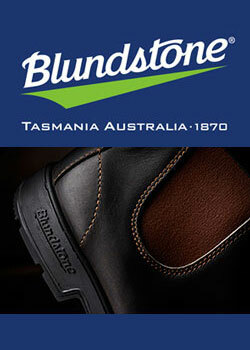 But alas, IBM signalled their intention to wind down their Wangaratta operations in 1998. Along with two U.S partners, Barry initiated the purchase of the plant and they started up Bluegum Technology in its place. He was installed as General Manager. “Talk about pressure in football……..That was pressure !” he jokes. He was invited to partake in Victorian Premier Steve Bracks’ ‘Breakfast Club’ – a ‘Think-Tank’ of 20 of the state’s leading industry and business figures. The list included identities such as Lindsay Fox, Joe Gutnick, Ted Kunkel and Solomon Lew. “Gee, I was way out of my depth there,” he says. After operating successfully for some time, the consortium received an offer, and sold Bluegum to Selectron, a global electronics company. So he joined ADI ( now Thales ), as explosives manager, before eventually becoming General Manager, in charge of more than 1,000 staff throughout Australia. Some time ago, Sully decided it was time to assume more control of his life and retreat from the rigours of the corporate world. He now operates his own business advisory company. It means he’s still in demand, but can work at his own pace (which is flat-chat). 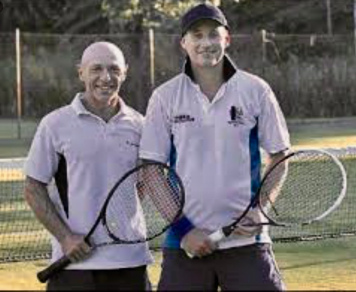 It also allows him more time to devote to the things about which he’s passionate – family, tennis, fishing and footy. He’s a Country Week tennis stalwart of more than twenty years, and his wife Maree is a triple Club singles champ. Zach (now 20) has also inherited a love of the game. 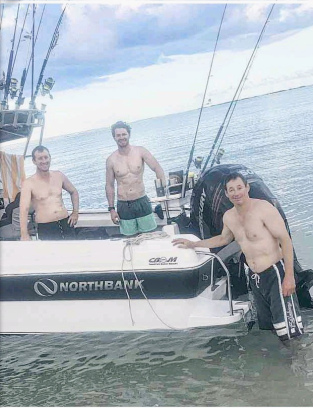 Sully took the opportunity to merge his sporting and business acumen when he was enjoying a fishing trip on the stunning Gulf of Carpentaria coastline with a friend, ‘Bomber’ Farrell. ‘Bomber’ met Geelong champ Patrick Dangerfield, who was involved in a footy clinic at Groote Eylandt at the time, and indicated that he was keen to ‘dangle a line’. After his playing days wound down, Sully remained firmly entrenched in the Rovers camp. His succession of roles have included stints as Runner, Board Member, Football Director and Vice-President. He’s now heavily involved in recruiting and is well aware of the monumental challenge facing he – and others – to help drag the Hawks from their unaccustomed position at the foot of the O&M ladder.